The molecular mechanisms underlying the initiation of innate and adaptive proallergic Th2-type responses in the airways are not well understood. IL-33 is a new member of the IL-1 family of molecules that is implicated in Th2-type responses. Airway exposure of naive mice to a common environmental aeroallergen, the fungus Alternaria alternata, induces rapid release of IL-33 into the airway lumen, followed by innate Th2-type responses. Biologically active IL-33 is constitutively stored in the nuclei of human airway epithelial cells. Exposing these epithelial cells to A. alternata releases IL-33 extracellularly in vitro. Allergen exposure also induces acute extracellular accumulation of a danger signal, ATP; autocrine ATP sustains increases in intracellular Ca2+ concentration and releases IL-33 through activation of P2 purinergic receptors. Pharmacological inhibitors of purinergic receptors or deficiency in the P2Y2 gene abrogate IL-33 release and Th2-type responses in the Alternaria-induced airway inflammation model in naive mice, emphasizing the essential roles for ATP and the P2Y2 receptor. Thus, ATP and purinergic signaling in the respiratory epithelium are critical sensors for airway exposure to airborne allergens, and they may provide novel opportunities to dampen the hypersensitivity response in Th2-type airway diseases such as asthma. Th2-type immune responses are important for the control of helminth infection, and they are responsible for the development of asthma and allergic inflammation in mucosal organs (1). In genetically susceptible individuals, asthma can be induced and/or exacerbated by environmental stimuli, such as allergens (e.g., house dust mite, molds, and cockroaches), infection with viruses, and airborne pollutants (2, 3). In addition to the Th2 cell-mediated adaptive immune response, asthma is strongly influenced by the innate immune responses from airway cells, such as epithelial cells, mast cells, NKT cells, and dendritic cells (DCs) (4, 5). However, the immunological and molecular mechanisms linking environmental exposure and activation of innate and adaptive Th2-type immune responses in the airways remain enigmatic. Infection and tissue injury induce inflammation and immune responses (6). During an infection, microorganisms initiate a series of inflammatory responses through their pathogen-associated molecular pattern molecules. Th2-type immune responses can be induced by an experimental allergen, OVA, contaminated with a low-dose LPS (7) or by an allergen’s structural capacity to stimulate the TLR4 (8). Alternatively, immune cells react to tissue injury by recognizing the molecules that are normally located inside the cell, but are released by injured cells (9). These damage-associated molecular patterns (DAMPs) interact predominantly with host pattern recognition receptors and induce inflammation and immune responses. A classic Th2-type adjuvant, alum, likely uses this injury-mediated mechanism by inducing the release of uric acid (10). However, airborne allergens or environmental pollutants generally do not infect hosts and are unlikely to injure tissues. Thus, when mammals are exposed to allergens or pollutants, do these infection or tissue injury models apply to the development of Th2-type immune responses? Among the most potent molecules of the innate immune system are the IL-1 family members (11); these cytokines, such as IL-1, IL-18, and IL-33, are evolutionarily ancient and are involved in regulating innate and adaptive immune responses. IL-33 (or IL-1F11) is a ligand of the orphan T1/ST2 receptor (12); it was first described as a NF abundantly expressed in the nucleus of endothelial and epithelial cells (13–16). In vivo systemic administration of IL-33 to mice profoundly alters immunity and inflammation, including lung and gastrointestinal eosinophilia and increased levels of serum IgE and IgA (12). IL-33 is implicated in diseases, for example, asthma (17), anaphylactic responses (18), and cardiovascular and rheumatoid diseases (19). Cells in barrier tissues constitutively express and store IL-33, suggesting its central role in mucosal immunity (19). IL-33 drives production of cytokines and chemokines by Th2 cells, mast cells, basophils, eosinophils, NKT cells, and NK cells (12, 20–29). More recent studies reported that IL-33 can induce proliferation of and Th2 cytokine production by a novel non-T/non-B cell population (30–32). Thus, IL-33 may be important in innate and adaptive Th2-type immune responses. However, the mechanisms for the synthesis, processing, and release of IL-33 remain poorly understood (19). Unlike IL-1β, pro–IL-33 (i.e., full-length 31-kDa protein) has biological activity (33–35), and IL-33 does not require proteolytic maturation by caspase-1 (33, 34). Thus, IL-33 may be an “alarmin” that is released during necrotic cell death and associated with infection or tissue injury (33, 36). Lung, skin, and intestinal epithelial cells that interact with the external environment produce antimicrobial molecules, cytokines, and chemokines that are essential for innate and adaptive immunity (37). In this study, we sought to identify the mechanisms for the innate immune regulation of airway Th2-type responses that are induced by exposure to natural environmental allergens. In humans, an association between fungal exposure, in particular to Alternaria alternata, and asthma is recognized clinically and epidemiologically (38, 39). Severe asthma and life-threatening acute exacerbations of asthma in humans have been associated with increased airborne exposure to Alternaria (40–42). Thus, we used Alternaria to provoke Th2-type immune responses relevant to human diseases. Airway exposure of naive mice to Alternaria induces rapid secretion of IL-33 into the airways and subsequent Th2-type cytokine production. In response to Alternaria allergens, airway epithelial cells translocate nuclear IL-33 and actively release it into the extracellular milieu. ATP-mediated activation of a P2 purinergic receptors and sustained increases in intracellular calcium concentration ([Ca2+]i) are required for this IL-33 secretion in vitro and in vivo. Thus, the airway epithelium responds to noncytolytic “stress” induced by components within our atmospheric environment by releasing ATP, leading to Th2-type inflammatory or possibly homeostatic immune responses. Animals were bred and maintained under specific pathogen-free conditions; all animal experiments were done with the approval of and in accordance with regulatory guidelines and standards set by the Institutional Animal Care and Use Committee of Mayo Clinic–Rochester. BALB/c, C57BL/6, Rag1−/− (B6.129S7-Rag1tm1Mom/J), P2X7R−/− (B6.129P2-P2rx7tm1Gab/J), and P2Y2R−/− (B6.129P2-P2ry2tm1bhk/J) were from The Jackson Laboratory. Myd88−/− mice on the C57BL/6 background were provided by Dr. Larry Pease (Mayo Clinic–Rochester). ST2−/− (Il1rl1−/−) mice on the BALB/c background (43) were provided by Dr. Andrew N. McKenzie (Medical Research Council Laboratory of Molecular Biology, Cambridge, U.K.). Female mice (7–13 wk old) were used. Normal human bronchial airway epithelial (NHBE) cells were maintained in serum-free bronchial epithelial cell growth medium (BEGM) (both from Lonza); cells were used within three passages. Recombinant human IL-33, recombinant mouse IL-33, goat anti-human IL-33, and goat anti-mouse ST2/IL-4R4 were from R&D Systems. Zymosan, periodate oxidized ATP (oATP), apyrase, Nonidet P-40, UTP, and LPS from Escherichia coli 0111:B4 were purchased from Sigma-Aldrich. Polyinosinic-polycytidylic acid (poly(I:C)) was from InvivoGen. EGTA, suramin sodium salt, BAPTA-AM, ionomycin, and thapsigargin were from Calbiochem. Pyridoxal-phosphate-6-azophenyl-2′,4′-disulfonic acid (PPADS) was from Tocris Bioscience. Culture filtrate extracts of A. alternata and Oriental cockroach were from Greer Laboratories and they contained 0.003 μg/mg and 1.4 μg/mg endotoxin, respectively. Rabbit anti-human IL-33 and rabbit anti-human high mobility group box-1 (HMGB1) were from MBL International and Abcam, respectively. Rabbit anti-P2X7R Ab was from Proteintech Group, and rabbit anti-P2Y2R Ab was from Thermo Fisher Scientific. Normal rabbit IgG was from Santa Cruz Biotechnology. FITC-conjugated goat anti-rabbit IgG was from Jackson ImmunoResearch Laboratories. Mice were lightly anesthetized with i.p. injection of tribromoethanol (Avertin) and 50 μl PBS or Alternaria extract (50 μg for BALB/c background and 100 μg for C57BL/6 background) or LPS (1 μg) in 50 μl PBS were intranasally administered (44). In some experiments, P2 purinergic receptor antagonists, oATP (4 mM) or suramin (2 mM), were mixed with the Alternaria extract, and this mixture was administered to the airways. Mice were killed by an overdose of pentobarbital. After cannulating the trachea, the lungs were lavaged with HBSS (1.0 ml). The supernatants of bronchoalveolar lavage (BAL) fluids were collected and stored at −20°C for cytokine assays. Whole lungs were homogenized in 1.0 ml PBS. The homogenates were centrifuged at 10,000 × g at 4°C for 15 min, and the protein concentrations of the supernatants were quantitated with a DC protein assay kit (Bio-Rad). The concentrations of IL-1β, IL-5, IL-6, IL-13, and IL-33 in BAL and lung homogenate supernatants were analyzed by ELISA (R&D Systems), using the manufacturer’s procedures. To detect IL-33 in tissue specimens, formalin-fixed paraffin-embedded sections were deparaffinized and rehydrated. Ag retrieval was performed by heating the sections for 30 min in Tris-EDTA buffer (pH 9.0; Dako). The sections were stained using HRP/3-amino-9-ethyl-carbazole detection kits from Lab Vision or R&D Systems, using manufacturers’ instructions; rabbit anti-human IL-33 or normal rabbit IgG were used as primary Abs. Sections were counterstained with Vectastain hematoxylin QS and mounted in Faramount (Dako). NHBE cells were cultured on Lab-Tek 2 chamber slides (Fisher Scientific). After stimulation with Alternaria extract (50 μg/ml), LPS (1 μg/ml), poly(I:C) (10 μg/ml), ionomycin (1 μM), or thapsigargin (3 μM) for 4 h, the cells were incubated with GolgiPlug (BD Pharmingen) for 30 min at 4°C. In some experiments, NHBE cells were cultured with Alternaria extract plus the calcium chelators EGTA (1 mM) or BAPTA-AM (50 μM). The slides were fixed and permeabilized by Cytofix/Cytoperm reagents (BD Pharmingen) for 20 min at 4°C and then washed with BD Perm/Wash buffer for 30 min at room temperature. Fixed cells were blocked with 5% normal rabbit serum (Sigma-Aldrich) for 1 h and stained overnight with rabbit anti-human IL-33, rabbit anti-HMGB1, or normal rabbit IgG at 4°C. To detect P2 purinergic receptors, cells were stained overnight with anti-P2X7R, anti-P2Y2R, or normal rabbit IgG at 4°C. For immunofluorescence, the cells were incubated with FITC-conjugated goat anti-rabbit IgG for 2 h at room temperature, washed in BD Perm/Wash buffer for 30 min, and mounted in Vectashield mounting medium with DNA-binding dye, DAPI (Vector Laboratories). Fluorescent images were visualized using a confocal microscope (LSM510 confocal microscope), and digital images (512 × 512 pixels, ×800 magnification) were captured by using the KS400 image analysis system (both Carl Zeiss). The threshold for each negative control image was calibrated to a baseline value without positive pixels. All images were processed using the Zeiss LSM image browser. NHBE cells were seeded (3 × 104 cells/well) in a 24-well tissue culture plates and grown until 80% confluence, usually 4 d. These cells were then stimulated with Alternaria extract (50 μg/ml), Oriental cockroach extract (50 μg/ml), zymosan (200 μg/ml), poly(I:C) (10 μg/ml), LPS (1 μg/ml), ionomycin (1 μM), or thapsigargin (3 μM) for 2 h (for IL-33 release) or 8 h (for IL-6 production). Cell-free supernatants were collected and analyzed for IL-6 or IL-33 by ELISA (R&D Systems). Lactate dehydrogenase (LDH) activity in the supernatants was measured using a cytotoxicity detection kit (Roche Applied Science). In some experiments, NHBE cells were preincubated with apyrase (30 U/ml), oATP (100 μM), or suramin (300 μM) for 30 min at 37°C before adding Alternaria extract. Total cellular IL-33 was recovered with five freeze/thaw cycles or treating cells with 0.5% Nonidet P-40. When 30–50% confluent, NHBE cells were transfected with small interfering RNAs (siRNAs) targeting P2X7R or P2Y2R or control RNA at 5 nM using HiPerFect transfection reagent (Qiagen). The transfected cells were grown for 48 h and then stimulated with Alternaria extract (50 μg/ml) for 2 h. Target gene knockdown was verified by examining expression of P2X7R and P2Y2R mRNA by real-time RT-PCR. Briefly, total RNA was purified with TRIzol (Invitrogen); DNase digestion used DNase I amplification grade (Invitrogen). cDNAs were synthesized from 1 μg purified RNA using an iScript cDNA synthesis kit (Bio-Rad). The reaction used incubation at 45°C for 60 min and was stopped by heating to 85°C for 5 min. The real-time RT-PCR reactions contained 1 μl cDNA, 12.5 μl TaqMan Universal PCR Master Mix, and 1.25 μl TaqMan gene expression assay of the target genes: P2X7R (Hs00175721_m1), P2Y2R (Hs01856611_s1), and 18s (Hs99999901_s1) (18S; as an endogenous control) (Applied Biosystems); the final reaction volume was 20.0 μl with sterile water. Amplification and detection of specific products were performed using the iQ5 multicolor real-time PCR detection system (Bio-Rad). The protocol was as follows: denaturation by a hot start at 95°C for 10 min, followed by 40 cycles of a two-step program (denaturation at 95°C for 15 s and annealing/extension at 60°C for 1 min). Transcription was normalized to the 18S rRNA transcription. NHBE cells (1 × 107 cells/ml) were lysed with RIPA lysis buffer (Santa Cruz Biotechnology). Culture supernatants from NHBE cells, which were treated with five freeze/thaw cycles (45) or stimulated with Alternaria extract for 2 h, were also obtained. Cell lysates and supernatants were concentrated by lyophilization. The samples were boiled for 10 min and aliquots equivalent to 1.3 × 105 cells were electrophoresed on a 10% NuPAGE Novex Bis-Tris gel with MOPS buffer (Invitrogen). After protein transfer, the nitrocellulose membrane was cut, blocked in milk buffer, and incubated with normal rabbit IgG or rabbit anti-human IL-33 (1 μg/ml). HRP-conjugated goat anti-rabbit IgG was used for detection, and the blot was developed using an ECL kit (Amersham Pharmacia Biotech), followed by exposure to BioMax film (Kodak). Viability of NHBE cells was examined with the LIVE/DEAD cellular viability/cytotoxicity kit (Invitrogen) that uses calcein acetoxymethyl (calcein AM) and ethidium homodimer-1(EthD-1) dyes to detect active esterase and compromised membrane integrity, respectively. After incubation with medium or Alternaria extract (50 μg/ml) for 2 or 8 h, NHBE cells were incubated with 2 μM calcein AM and 4 μM EthD-1 for 30 min at room temperature. Using fluorescence microscopy, intact (calcein AM positive and EthD-1 negative) and damaged (EthD-1 positive) cells in five randomly chosen fields were counted and expressed as percentage of cells over the total cells (≥500 cells were counted). NHBE cells were seeded at low density on coverslip chamber slides for 48–72 h in BEGM. In some experiments, cells were treated with P2X7R siRNA, P2Y2R siRNA, or control RNA, as described above. To measure calcium, the BEGM was replaced with HBSS containing 10 mM HEPES buffer (pH 7.4), and the cells were loaded with 10 μM fura 2-AM (Invitrogen) for 90 min, washed in HBSS, and mounted onto the stage of a Nikon Diaphot inverted microscope with an epifluorescence attachment. Fluorescence in single cells was visualized using a Nikon ultraviolet Fluor ×20 or ×40 oil-immersion objective. The fluorescence excitation, image acquisition, and real-time data analyses were controlled by Image-1 Metamorph software (Universal Imaging). [Ca2+]i was measured as the ratio of fluorescence emitted at 510 nm when the cells were alternately excited at 340 and 380 nm. Alternaria extract and P2R antagonists were introduced by single-pass, continuous-flow perfusion. [Ca2+]i was calculated using the fura 2-AM calcium imaging calibration kit (Invitrogen). To measure ATP levels in cell culture supernatants, NHBE cells were treated with medium alone, Alternaria extract (50 μg/ml), or Oriental cockroach extract (50 μg/ml) for periods ≤32 min in a 24-well tissue culture plate. Cell culture media was collected and immediately placed on ice. ATP concentrations were measured with an ATP determination kit (Bioassay Systems) and a luminometer, following the manufacturer’s instructions. Isolated CD4+ T cells were cultured with BM-derived DCs and cell lysates as previously described (29). Briefly, CD4+ T cells isolated from spleens of BALB/c mice were seeded at 1 × 106 cells/ml in round-bottom 96-well tissue culture plates and incubated with bone marrow-derived DCs from BALB/c mice at a 1:10 DC/T cell ratio with medium or with a 10% freeze/thaw lysate of NHBE cells for 10 d. To block the IL-33–ST2 pathway, goat anti-human IL-33 (10 μg/ml), goat anti-mouse ST2 Ab (10 μg/ml), or normal goat IgG (control Ab; 10 μg/ml) were included. Supernatants were collected and concentrations of IL-5, IL-13, and IFN-γ were measured by ELISA (R&D Systems). All data are reported as the mean ± SEM from the indicated number of replicates. Two-sided differences between two samples were analyzed with the Mann–Whitney U test or Student t test. Multiple comparisons between treatment and control conditions were performed by ANOVA. The p values < 0.05 were considered significant. To investigate the immunological mechanisms of asthma and Th2-type airway immunity, we used a naive mouse model and administered Alternaria extract (50 μg/dose) into the airways of mice. A bacterial product and TLR4 agonist, namely LPS (1 μg/dose), acted as control. The Alternaria extract contained minimal endotoxin (3 ng/mg, 0.15 ng/dose). Six hours later, Th2 cytokine levels, including IL-5 and IL-13, were increased in Alternaria-exposed lungs of BALB/c mice (Fig. 1A); by 24 h, these cytokine levels decreased. IL-5 and IL-13 levels did not increase in LPS-exposed mice. IL-4 was undetectable in LPS- and Alternaria-exposed BALB/c mice. Interestingly, within 1 h after receiving Alternaria extract, IL-33 levels increased markedly in BAL fluids, preceding the increases in IL-5 and IL-13; LPS did not induce IL-33 in BAL fluids. After receiving LPS, IL-1β levels in BAL fluids increased from 6 to 24 h; Alternaria induced small increases in IL-1β levels. Similarly, in C57BL/6 mice (Fig. 1B), IL-33 levels increased markedly in BAL fluids within 1 h after receiving Alternaria extract; the levels of IL-5 and IL-13 were increased by 6 and 12 h, respectively. Thus, respiratory exposure to the fungus increases airway IL-33 levels that are followed by increases in Th2 cytokines in both BALB/c and C57BL/6 mice; LPS increases IL-1β levels, but not IL-33 or Th2 cytokines. Airway exposure of naive mice to Alternaria extract induces IL-33 release and Th2-type immune responses. 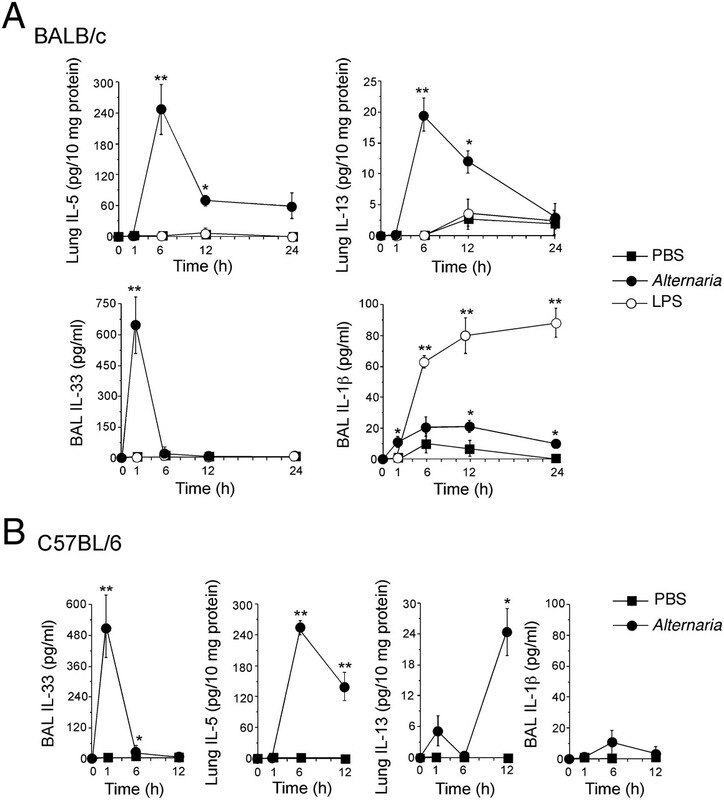 BALB/c or C57BL/6 mice received intranasal PBS, Alternaria extract, or LPS. Mice were killed and BAL fluids and lungs were collected. Kinetics of IL-5 and IL-13 levels (lung) and IL-33 and IL-1β levels (BAL) in BALB/c mice (A) and C57BL/6 mice (B) are shown. Bars represent the mean ± SEM (three or four mice per treatment group per each time point). *p < 0.05, **p < 0.01 compared with PBS-treated mice by Student t test. To examine the role of IL-33 in Th2 cytokine responses, we used mice deficient in the IL-33 receptor T1/ST2 (ST2−/−) (46). Alternaria-induced increases in IL-5 and IL-13 were reduced to baseline levels (i.e., PBS) in ST2−/− mice (Fig. 2A), but increases in IL-6 or IL-33 were not affected. The production of IL-5 and IL-13 in Alternaria-exposed mice was similar in Rag1−/− and wild-type mice (Fig. 2B), suggesting that these Th2-type cytokine responses are independent of adaptive immunity. The production of IL-33 was not significantly affected in Rag1−/− mice. An adaptor protein, MyD88, mediates signal transduction by most TLRs (47); MyD88 is also required for signaling of IL-1 family cytokines, such as IL-1β and IL-33 (48). Exposing MyD88−/− mice to Alternaria extract abolished IL-5 and IL-13 production (Fig. 2C), consistent with the potential involvement of IL-33, but the increase in BAL IL-33 was not affected. Thus, when mice are exposed to Alternaria, the MyD88-independent release of IL-33 likely mediates production of Th2-type cytokines in the airway mucosa through an innate mechanism or mechanisms. Early Th2-type immune response of naive mice exposed to Alternaria extract is dependent on the IL-33–ST2 pathway but independent of adaptive immunity. Mice deficient in ST2, Rag1, or MyD88 or their control mice received intranasal PBS or Alternaria extract. A, One (for IL-33) or 12 h (for IL-5, IL-6, and IL-13) after receiving PBS or Alternaria extract, BAL levels of IL-33 and IL-6 and lung levels of IL-5 and IL-13 were measured and compared between wild-type BALB/c and ST2−/− mice (BALB/c background). Bars represent the mean ± SEM (5–12 mice per strain per treatment group). **p < 0.01 compared with wild-type mice receiving Alternaria by Mann–Whitney U test. B, One (for IL-33) or 12 h (for IL-5 and IL-13) after receiving PBS or Alternaria extract, BAL levels of IL-33 and lung levels of IL-5 and IL-13 were measured and compared between wild-type C57BL/6 mice and Rag1−/− mice (C57BL/6 background). Bars represent the mean ± SEM (four to eight mice per strain per treatment group). C, Lung levels of IL-5 and IL-13 and BAL levels of IL-33 were compared between wild-type C57BL/6 and MyD88−/− mice (C57BL/6 background) 12 (for IL-5) or 1 h (for IL-33) after receiving PBS or Alternaria extract. Bars represent the mean ± SEM (five to six mice per strain per treatment group). **p < 0.01 compared with wild-type mice receiving Alternaria by Mann–Whitney U test. In resting conditions, epithelial cells in mucosal organs and vascular endothelial cells are probably the dominant cells expressing and storing IL-33 in their nuclei (15, 16). We used immunohistochemistry to verify localization of IL-33 in the nuclei of airway epithelial cells in human nasal tissues, especially in basal layer cells (Fig. 3A). To dissect the roles of epithelial cell-derived IL-33 in Th2-type immune responses, we cultured NHBE cells. By double-staining NHBE cells for IL-33 and DAPI, IL-33 was mainly localized in each nucleus with faint staining in the cytoplasm (Fig. 3B). As a control, we used HMGB1 protein (45), which is a prototypic nuclear alarmin (49). HMGB1 localized in the nuclei of NHBE cells (Fig. 3B). Immunoblot analysis revealed that IL-33 in NHBE cell lysates migrated as a 30- to 31-kDa band (Fig. 3C), suggesting that it is the full-length proform and unprocessed by caspase-1 (33–35). To examine whether this full-length IL-33 is biologically active, we incubated cocultures of CD4+ T cells and DCs with NHBE cell lysates. These lysates induced production of IL-5, IL-13, and IFN-γ by the CD4+ T cells (Fig. 3D). Treating the cells and lysates with anti-ST2 (i.e., IL-33 receptor) Ab or anti–IL-33 Ab abolished IL-5 production (p < 0.01, n = 4); these Abs partially inhibited IL-13 production (p < 0.05, n = 4). In contrast, IFN-γ production was unaffected, implicating roles for non–IL-33 molecules (e.g., HMGB1, uric acid) in the lysates that promote IFN-γ production. Biologically active full-length 30-kDa IL-33 protein is stored in nuclei of airway epithelial cells. A, Nasal specimens from 12 normal individuals were stained with rabbit anti-human IL-33 or normal rabbit IgG. Results shown are representative. Scale bars, 50 μm. Insets show higher magnifications of the epithelium. B, NHBE cells were cultured, fixed, permeabilized, and stained with rabbit anti-human IL-33 (upper panels) or rabbit anti-HMGB1 (lower panels), followed by FITC-conjugated goat anti-rabbit IgG. After mounting and staining with a nuclear staining dye, DAPI, cells were visualized by confocal microscopy. Left panels show FITC-images with anti–IL-33 or anti-HMGB1; middle panels show nuclear staining with DAPI (pseudocolored); right panels show overlays of left and middle panels. Results are representative of four independent experiments. Scale bar, 20 μm. C, Immunoblot analysis of NHBE cell lysate (left lane) and cell culture supernatant (right lane) used anti-human IL-33. Results are representative of three independent experiments. D, Isolated CD4+ T cells were cultured with DCs at a 1:10 DC/T cell ratio with medium alone or with a 10% freeze/thaw lysate of NHBE cells for 10 d. To block the IL-33–ST2 pathway, goat anti-human IL-33, goat anti-mouse ST2, or normal goat IgG was included. Concentrations of IL-5, IL-13, and IFN-γ were measured in supernatants by ELISA. Bars represent the mean ± SEM (six independent experiments). *p < 0.05, **p < 0.01 compared with the samples with lysate but without Abs by Mann–Whitney U test. To examine whether NHBE cells release nuclear IL-33 extracellularly after innate immunological stimulation, we incubated cells with extracts of common airborne allergens, Alternaria and Oriental cockroach (38, 50), or with TLR ligands, including zymosan (TLR2 ligand), poly(I:C) (TLR3 ligand), and LPS (TLR4 ligand). Immunoreactive IL-33 was mainly localized to the nuclei of resting NHBE cells (Fig. 4A). When cells were exposed to Alternaria, IL-33 appeared in the cytoplasm, but HMGB1 remained in the nuclei. Furthermore, unlike Alternaria, poly(I:C) did not induce cytoplasmic localization of IL-33. IL-33 is released extracellularly in a noncytotoxic manner by NHBE cells exposed to allergen extracts. A, NHBE cells were stimulated with medium (upper panels), Alternaria extract (left and middle lower panels), or poly(I:C) (right lower panel) for 4 h. Cells were stained and analyzed as in Fig. 3. In upper row, left panel shows FITC images with anti–IL-33, middle panel shows nuclear staining with DAPI (pseudocolored), and right panel shows overlay of left and middle panels. In lower row, left panel shows overlay of anti–IL-33 and DAPI images, middle panel shows overlay of anti-HMGB1 and DAPI images, and right panel shows overlay of anti–IL-33 and DAPI images. Results are representative of four independent experiments. Original magnification ×1000. B, NHBE cells were incubated with medium alone or Alternaria extract (50 μg/ml) for up to 8 h. IL-33 and IL-6 concentrations in the cell-free supernatants were analyzed by ELISA. Error bars represent the mean ± SEM (six independent experiments). *p < 0.05, **p < 0.01 compared with cells stimulated with medium alone by Mann–Whitney U test. C, NHBE cells were stimulated with medium, Alternaria extract, Oriental cockroach extract, zymosan, poly(I:C), or LPS for 2 (for IL-33 release, left panel) or 8 h (for IL-6 production, right panel). Cell-free supernatants were analyzed for IL-6 or IL-33 by ELISA. Bars represent the mean ± SEM (six independent experiments). *p < 0.05, **p < 0.01 compared with medium alone by Mann–Whitney U test. D, Culture supernatants from NHBE cells, which were treated with five freeze/thaw cycles (left lane) or stimulated with Alternaria extract for 2 h (right lane), were analyzed by immunoblot with anti-human IL-33. Results are representative of three independent experiments. E, NHBE cells were stimulated with medium or Alternaria extract for 2 h or treated with five freeze/thaw cycles or 1% Nonidet P-40. Cell-free supernatants were analyzed for LDH activity and for IL-33. Bars represent the mean ± SEM (six independent experiments). **p < 0.01 compared with medium alone by Mann–Whitney U test. F, NHBE cells were incubated with medium or Alternaria extract for 2 or 8 h and then incubated with calcein AM and EthD-1 for 30 min. Upper panels show fluorescence images from confocal microscopy. Original magnification ×400. Lower panels show intact (calcein AM positive and EthD-1 negative) and damaged (EthD-1 positive) cells in five randomly selected fields that were were counted and expressed as percentage of intact or damaged cells/total cell number. Bars represent the mean ± SEM (three independent experiments). When NHBE cells were stimulated with Alternaria extract, IL-33 was released rapidly and reached a plateau by 2 h (Fig. 4B); in contrast, IL-6 production did not reach a plateau by 8 h. NHBE cells incubated with medium for 2 h released detectable IL-33 (Fig. 4C). When cells were incubated with Alternaria or Oriental cockroach extracts, IL-33 levels increased in the supernatants (p < 0.01); in contrast, exposure to various TLR ligands did not induce IL-33 release. When NHBE cells were incubated with zymosan or poly(I:C) for 8 h, they produced high IL-6 levels (p < 0.01); when cells were incubated with Alternaria, Oriental cockroach, or LPS, they produced low levels of IL-6 (p < 0.05). The IL-33 in the NHBE cell supernatants migrated as a 30- to 31-kDa band (Fig. 4D), suggesting that IL-33 is released as a noncleaved, full-length protein. Thus, IL-33 and IL-6 are released from NHBE cells by allergens and TLR ligands, respectively. IL-33 has been considered an alarmin that is released during cellular injury or necrotic cell death (33, 36). To address whether injury was responsible for extracellularly released IL-33 induced by Alternaria, we used indicators of cell membrane integrity, including LDH activity in cell-free supernatants and staining with the membrane-impermeable nucleic acid dye, EthD-1. When NHBE cells were exposed to medium or to Alternaria extract for 2 h, LDH activity was undetectable in the supernatants (Fig. 4E); when the cells were treated with freeze/thaw cycles or were exposed to a detergent, Nonidet P-40, LDH release was robust. No differences were observed in the permeability to EthD-1 between the cells incubated with medium alone or those incubated with Alternaria extract for ≤8 h (Fig. 4F). About 90% of NHBE cells were also alive with medium alone or Alternaria extract, as judged by conversion of calcein AM to fluorescent calcein. Overall, when NHBE cells are exposed to Alternaria, stored IL-33 was rapidly and actively released without apparent cellular injury. We next addressed how airway epithelial cells might “sense” the allergens and release stored IL-33. Under stress conditions, many plant and animal cells release ATP via lytic or nonlytic mechanisms, and extracellular ATP can be a danger signal and a mediator of inflammation (51). When we exposed NHBE cells to fresh medium, within 60 s after exchange of medium we detected ATP in the cell supernatants (Fig. 5A). ATP levels returned to baseline levels within 4 min, likely because of ecto-ATPase activity (52). Importantly, when we added allergen extracts (e.g., Alternaria and Oriental cockroach) to NHBE cells, the peak extracellular ATP levels were ∼2.5-fold higher than with medium alone, and these elevated ATP levels were sustained over a longer time course. Exposure of NHBE cells to allergen extracts induces extracellular ATP release and increases [Ca2+]i. A, NHBE cells were treated with medium, Alternaria, or Oriental cockroach extracts. The kinetics of ATP concentrations in cell-free supernatants were measured. Bars represent the mean ± SEM (four independent experiments). *p < 0.05, **p < 0.01 compared with medium alone by Mann–Whitney U test. B, NHBE cells were loaded with fura 2-AM and exposed to Alternaria extract. Fluorescence in single cells was monitored and analyzed by inverted microscopy, as described in Materials and Methods. Upper panels show [Ca2+]i in NHBE cell monolayer with pseudocolors (green < yellow < orange < red < white in the order of [Ca2+]i). Left panel shows before exposure, and right panel shows 300 s after exposure to Alternaria. Original magnification ×400. Lower panels use pseudocolors to show the kinetic changes in [Ca2+]i in a randomly selected NHBE cell. Images 1 through 6 were taken at 285, 293, 301, 317, 333, and 347 s after exposure to Alternaria. Results are representative of five independent experiments. Original magnification ×1000. C, NHBE cells were loaded with fura 2-AM, preincubated with or without EGTA, exposed to Alternaria extract (arrow), and 600 s later 10 μM UTP (arrow) was added to the cells with EGTA. Fluorescence and [Ca2+]i in single cells were analyzed as described above. Left panel shows kinetic changes in [Ca2+]i in one experiment from 50 randomly selected cells, representative of three experiments. Right panel shows [Ca2+]i before (basal) and 400 s after exposure to Alternaria. Bars represent the mean ± SEM (three independent experiments each with 50 cells). **p < 0.01 compared with basal [Ca2+]i by Student t test. Most of the NHBE cells exposed to Alternaria extract showed a rapid and robust increase in [Ca2+]i (Fig. 5B). [Ca2+]i increases started simultaneously in nuclear and perinuclear regions (panel 3) and expanded to the entire cell (panel 5) by 333 s. By 300 s the [Ca2+]i gradually increased with a peak response between 400 and 600 s (Fig. 5C). When extracellular calcium was chelated with EGTA, the Alternaria-induced [Ca2+]i response was abolished, suggesting that Ca2+ influx mainly mediates the response. 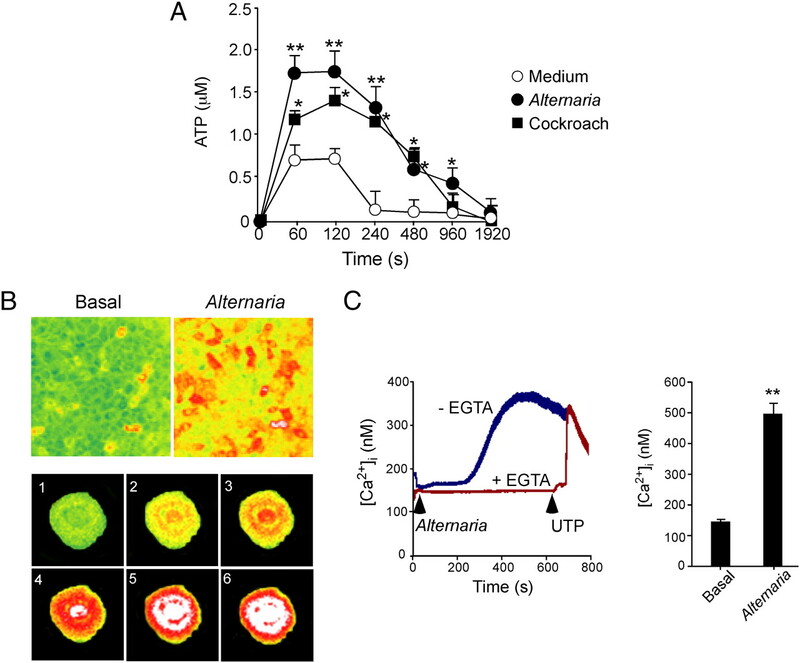 Addition of UTP to EGTA-treated, Alternaria-exposed NHBE cells induced a rapid and sharp [Ca2+]i response, suggesting that the pathways to release Ca2+ from intracellular sources are intact. At 400 s, the Alternaria-induced [Ca2+]i in NHBE cells was reproducibly elevated compared with basal levels of [Ca2+]i (p < 0.01). 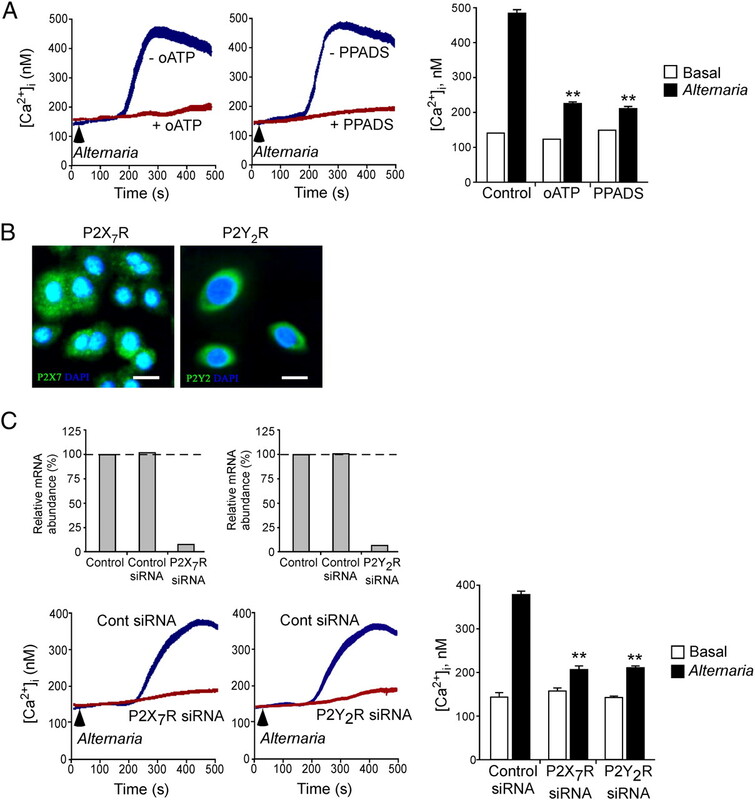 We next addressed the link between increases in extracellular ATP, activation of P2 purinergic receptors, and the regulation of [Ca2+]i. P2 receptors mediate the effects of extracellular ATP on cell communication (53) and are comprised of G protein-coupled P2Y receptors that regulate Ca2+ release from internal stores (54, 55) and ion channel forming P2X receptors that function as nonselective cation channels (56). We investigated the roles of P2 purinergic receptors by pretreating NHBE cells with two wide-spectrum antagonists, namely oATP (57) and PPADS (58). Both inhibitors suppressed the Alternaria-induced [Ca2+]i response (p < 0.01) (Fig. 6A); these agents did not affect the basal [Ca2+]i response. After several P2XR and P2YR family members were evaluated through various antagonists, we focused on P2X7R and P2Y2R because of their known affinities for ATP and because airway epithelial cells express these receptors (Fig. 6B). siRNA-mediated knockdown of P2X7R in NHBE cells led to a 93% decrease in P2X7R mRNA and inhibited the Alternaria-induced [Ca2+]i response by 80% (p < 0.01) (Fig. 6C). Similarly, siRNA-mediated knockdown of P2Y2R in NHBE cells led to a 95% decrease in P2Y2R mRNA and inhibited the Alternaria-induced [Ca2+]i response by 75% (p < 0.01). siRNA targeting P2X7R or P2Y2R did not affect basal [Ca2+]i. Thus, autocrine release of ATP and activation of P2 purinergic receptors appear to be involved in sensing exposure to aeroallergens and the subsequent increase in [Ca2+]i in airway epithelial cells. Blockade of P2 purinergic receptors by pharmacologic agents or siRNA attenuates Ca2+ response in NHBE cells exposed to Alternaria extract. A, NHBE cells were loaded with fura 2-AM, preincubated with or without 300 μM oATP or 50 μM PPADS, and exposed to Alternaria extract (see arrows). Fluorescence and [Ca2+]i in single cells were analyzed as in Fig. 4. Left and middle panels show kinetic changes in [Ca2+]i in one experiment from 50 randomly selected cells, representative of three experiments. Right panel shows [Ca2+]i before (basal) and 400 s after exposure to Alternaria. Bars represent the mean ± SEM (three independent experiments with 50 cells each). **p < 0.01 compared with [Ca2+]i after Alternaria exposure without oATP or PPADS by ANOVA. B, NHBE cells were fixed, permeabilized, and stained with rabbit anti-P2X7R or anti-P2Y2R, followed by FITC-conjugated goat anti-rabbit IgG. After mounting and staining with DAPI, cells were visualized by confocal microscopy. Results are representative of three independent experiments. Scale bar, 20 μm. C, NHBE cells were transfected with siRNA against P2X7R or P2Y2R or control RNA and grown for 48 h. Expression levels of P2X7R and P2Y2R mRNA by NHBE cells were examined by real-time RT-PCR. In replicate wells, transfected NHBE cells were loaded with fura 2-AM and exposed to Alternaria (see arrows). Fluorescence and [Ca2+]i in single cells were analyzed as in Fig. 4. Left upper panels show expression of P2X7R and P2Y2R mRNA. Data were normalized to the amounts of P2X7R and P2Y2R mRNA in NHBE cells without siRNA transfection as 100%. Results are representative of three experiments. Left lower panels show kinetic changes in [Ca2+]i in one experiment from 50 randomly selected cells, representative of three experiments. Right panel shows [Ca2+]i before (basal) and 400 s after exposure to Alternaria. Bars represent the mean ± SEM (three independent experiments each with 50 cells). **p < 0.01 compared with [Ca2+]i after exposure to Alternaria in the cells treated with control siRNA by ANOVA. To examine the roles of ATP-induced [Ca2+]i increases in IL-33 release, NHBE cells were incubated with Alternaria extract in the presence of the Ca2+ chelators EGTA or BAPTA-AM. By immunohistochemistry, EGTA treatment blocked the Alternaria-induced transport of IL-33 from nucleus to cytosol (Fig. 7A). EGTA and BAPTA-AM inhibited the Alternaria-induced IL-33 release into the extracellular media (p < 0.01 and p < 0.05, respectively, n = 5), whereas basal IL-33 release with medium was unaffected (Fig. 7B). Conversely, to examine whether increases in [Ca2+]i are sufficient to induce IL-33 release, NHBE cells were incubated with a calcium ionophore, ionomycin, or with a Ca2+-ATPase inhibitor, thapsigargin, which depletes Ca2+ from reticular stores, leading to the activation of Ca2+ channels and Ca2+ entry (59). Ionomycin treatment localized IL-33 to cytoplasmic organelles with an apparent vesicular structure (Fig. 7C); in contrast, ionomycin did not affect the localization of nuclear HMGB1. Thapsigargin treatment showed IL-33 localization in the cytoplasm similar to ionomycin and did not affect localization of HMGB1. Furthermore, IL-33 was detected in the supernatants of NHBE cells treated with ionomycin or thapsigargin (p < 0.05) (Fig. 7D). Thus, increased [Ca2+]i is likely necessary and sufficient to release IL-33 from NHBE cells. Importantly, treatment of NHBE cells with wide-spectrum inhibitors for P2 purinergic receptors (i.e., oATP and suramin) (60) or enzymatic removal of ATP from the incubation medium by exogenous ATPase (i.e., apyrase) abrogated Alternaria-induced extracellular release of IL-33, suggesting critical roles for ATP and P2 purinergic receptors in IL-33 release (Fig. 7E). Indeed, depletion of specific transcripts for P2X7R or P2Y2R by siRNA inhibited IL-33 release from NHBE cells in response to Alternaria (p < 0.05, n = 5) (Fig. 7F). ATP-mediated increase in [Ca2+]i is necessary and sufficient to translocate and release nuclear IL-33. A, NHBE cells were preincubated without (left panel) or with (right panel) 1 mM EGTA and stimulated with Alternaria extract for 4 h. The cells were stained with anti-human IL-33 and DAPI and analyzed as in Fig. 2. Panels show overlay of anti–IL-33 and DAPI images and are representative of four independent experiments. Original magnification ×1000. B, NHBE cells were preincubated with medium, EGTA, or BAPTA-AM and stimulated with medium or Alternaria extract for 2 h. IL-33 in cell-free supernatants was analyzed by ELISA. Bars represent the mean ± SEM (six independent experiments). *p < 0.05, **p < 0.01 compared with cells stimulated with Alternaria without inhibitors by Mann–Whitney U test. C, NHBE cells were treated with medium (left), ionomycin (middle), or thapsigargin (right) for 4 h. The cells were stained with anti-human IL-33 (upper panels) or anti-HMGB1 (lower panels) and DAPI and analyzed as in Fig. 2. Upper panels show overlay of anti–IL-33 and DAPI, and lower panels show overlay of anti-HMGB1 and DAPI. Results are representative of four independent experiments. Original magnification ×1000. D, NHBE cells were incubated with medium, ionomycin, or thapsigargin for 2 h. IL-33 in cell-free supernatants was analyzed by ELISA. Bars represent the mean ± SEM (four independent experiments). *p < 0.05 compared with cells incubated with medium alone by Mann–Whitney U test. E, NHBE cells were preincubated with medium, oATP, suramin, or apyrase and stimulated with medium or Alternaria extract for 2 h. IL-33 in cell-free supernatants was analyzed by ELISA. Bars represent the mean ± SEM (six independent experiments). *p < 0.05 compared with cells stimulated with Alternaria without inhibitors by Mann–Whitney U test. F, NHBE cells were untreated (control) or transfected with siRNA against P2X7R or P2Y2R or control siRNA and cultured for 48 h. Cells were stimulated with medium or Alternaria extract for 2 h. IL-33 in cell-free supernatants was analyzed by ELISA. Bars represent the mean ± SEM (six independent experiments). *p < 0.05 compared with control siRNA-treated cells stimulated with Alternaria extract by Mann–Whitney U test. To test the importance of ATP as an innate sensor for allergen exposure in vivo, we used an airway model that exposed nonsensitized naive mice to Alternaria. As shown in Fig. 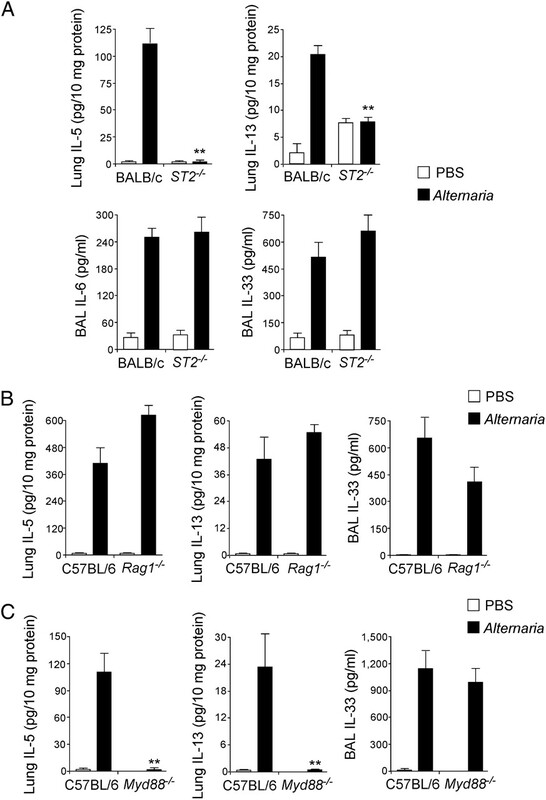 1 above, intranasally administered Alternaria extract rapidly increased BAL IL-33 within 1 h, followed by increased levels of lung IL-5 and IL-13 from innate sources by 6 h. We now used this model to examine the effects of blocking of P2 purinergic receptors in vivo with the same inhibitors as in the in vitro studies. Intranasally administered oATP plus Alternaria inhibited the Alternaria-induced increases in BAL IL-33 levels (p < 0.05) (Fig. 8A) and reduced both IL-5 and IL-13 production in the lungs (p < 0.05) (Fig. 8B). Similarly, mice exposed intranasally to Alternaria plus suramin showed minimal IL-33 release and IL-5 and IL-13 production. Administration of P2 purinergic receptor antagonists or deficiency in P2Y2 gene attenuates IL-33 release and innate Th2-type responses in mice. A, BALB/c mice received intranasal PBS or Alternaria extract mixed with PBS, oATP, or suramin. After 1 h, mice were killed, and IL-33 in BAL fluid supernatants was measured by ELISA. Bars represent the mean ± SEM (five mice per group). *p < 0.05 compared with mice receiving Alternaria without inhibitors by Mann–Whitney U test. B, BALB/c mice received intranasal PBS or Alternaria extract mixed with PBS, oATP, or suramin. After 12 h, mice were killed, and IL-5 and IL-13 in lung homogenates were measured by ELISA. Bars represent the mean ± SEM (five mice per group). *p < 0.05 compared with mice receiving Alternaria without inhibitors by Mann–Whitney U test. C, Wild-type C57BL/6 mice, P2X7−/−, or P2Y2−/− mice received intranasal PBS or Alternaria. After 12 h, mice were killed and IL-5 and IL-13 in lung homogenates were measured by ELISA. Error bars represent the mean ± SEM (six mice per group). *p < 0.05, **p < 0.01 compared with wild-type mice receiving Alternaria by Mann–Whitney U test. To determine whether deficiency in one of the P2 purinergic receptors is sufficient to modulate the innate Th2-type response to Alternaria, we administered Alternaria extract into the airways of P2X7−/− and P2Y2−/− mice (Fig. 8C). Production of both IL-5 and IL-13 was not affected in P2X7−/− mice. In contrast, production of IL-5 in the lungs was reduced in P2Y2−/− mice by 90% as compared with wild-type mice (p < 0.01). Similarly, IL-13 levels decreased by 70% in P2Y2−/− mice (p < 0.05). Thus, disrupting the ATP signaling pathway at the receptor level impairs allergen-induced IL-33 release and subsequent Th2-type immune responses in the airway mucosa. IL-1 family cytokines (e.g., IL-1β, IL-33) may be sorted into two groups, depending on their production, regulation, extracellular release, and their cellular sources (11). Pro–IL-1β is synthesized when monocytes or macrophages are exposed to microbial or tissue injury products, and it is released extracellularly after proteolytic processing to mature IL-1β by caspase-1. In contrast, IL-33 is constitutively expressed and stored in the nucleus of epithelial and endothelial cells. IL33 and IL1RL1 (i.e., ST2) genes have been implicated in asthma in a recent large-scale genome-wide association scan study (61). Increased expression of IL-33 by epithelial cells is also observed in patients with asthma (62). However, the molecular mechanisms involved in IL-33 production and release remain enigmatic. The major finding in this report is that when airway epithelial cells are exposed to environmental allergens, they actively and rapidly release IL-33. Sustained increases in [Ca2+]i are sufficient and necessary to translocate and release IL-33. Furthermore, extracellular accumulation of ATP appears pivotal in regulating the Ca2+ response and subsequent IL-33 release. In mice exposed to an environmental allergen, in vivo blockade of the P2 purinergic receptor pathways inhibited IL-33 release and Th2 cytokine production, suggesting biological significance of the ATP-mediated IL-33 release. Our findings are consistent with reports that showed biological activity for unprocessed full-length pro–IL-33 and showed that the processing and release of IL-33 probably does not involve caspase-1 (35). Thus, airway epithelial cells may use ATP to sense noncytolytic stress in the air we breathe and to initiate Th2-type immune responses by releasing preformed, full-length IL-33. Previous models proposed IL-33 as an alarmin, which is released during necrotic cell death associated with tissue damage or infection, similarly to a prototypic alarmin, HMGB1 (36). In theory, potential cytotoxic effects of allergen extracts might release IL-33 from airway epithelial cells. However, direct toxic effects appear unlikely because cell membrane integrity was not compromised after cells were exposed to Alternaria extract and after they released IL-33. Pharmacological inhibitors of P2 purinergic receptors and Ca2+-chelating agents also abolished IL-33 release in vitro and in vivo. Extracellular ATP serves as a danger signal to alert the immune system of tissue stress or damage (63). 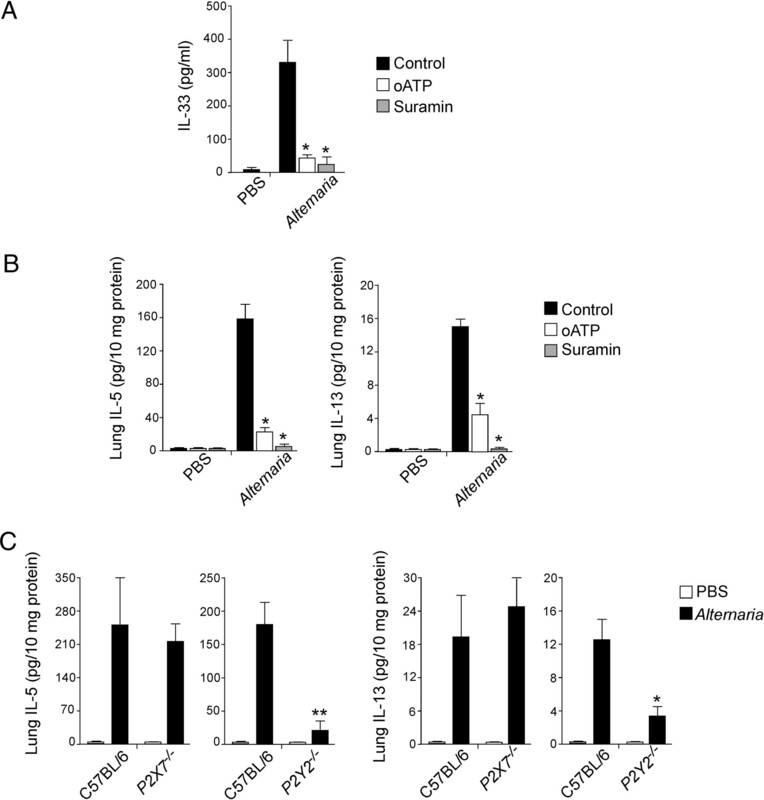 Increased levels of ATP are observed in BAL fluids of patients with asthma or sensitized mice challenged with an Ag (64). Neutralization of ATP inhibits Th2 sensitization to inhaled Ags and ongoing Th2-type airway inflammation (64). We also found that exposure to aeroallergens induces rapid extracellular release of ATP (Fig. 5), and neutralization of ATP or blocking of the P2 purinergic pathway inhibits IL-33 release and early innate Th2 type immune responses to an inhaled allergen (Figs. 7, 8). Taken together, these findings suggest that extracellular ATP plays pivotal roles in various stages of Th2-type immune responses and inflammation in the airways. By immunohistochemistry, both HMGB1 and IL-33 were localized in the nuclei of NHBE cells (Fig. 3). However, HMGB1 did not translocate to the cytoplasm when epithelial cells were exposed to Alternaria extract or to ionomycin, suggesting that the Ca2+ signal is unlikely to regulate HMGB1 release. Activated macrophages secrete HMGB1 after hyperacetylation of lysine residues (65), and necrotic cells release HMGB1 during cellular damage (45). Thus, distinct intracellular mechanisms may regulate the extracellular release of alarmin-like proteins, and different classes of molecules may be released depending on the cells’ conditions or cell types. Generally, in vivo cell necrosis triggers an acute inflammatory response by releasing DAMPs (66). Our freeze/thaw airway epithelial cell lysates were highly immunogenic and induced production of Th1 (IFN-γ) and Th2 cytokines (IL-5, IL-13) in the DC and CD4+ T cell coculture system. Thus, because aeroallergens induced ATP release, but no apparent cellular injury, they may trigger IL-33 release without DAMP release, resulting in a Th2-type immune response. Conversely, massive cellular damage to airway epithelial cells by microbial infection or toxic chemicals may release DAMPs as well as IL-33, resulting in Th1 and Th2 responses or a Th1-dominant response. The selective release of alarmin-like molecules from the airway epithelium appears to modulate the magnitude and nature of inflammation. IL-33 release by airway epithelial cells may involve different innate immunological stimuli other than conventional TLRs. In this study, while TLR agonists induced IL-6 production by airway epithelial cells, TLR agonists in vitro or LPS in vivo did not induce IL-33 release. Furthermore, in mice exposed to Alternaria, IL-33 release was induced even in MyD88-deficient mice. Proinflammatory stimuli, such as IL-1β and TNF-α, inhibit transcription of IL-33 in endothelial cells (16). Thus, IL-33 production and release are independent of, or rather negatively regulated by, the TLRs and the NF-κB signaling pathway. Instead, in airway epithelial cells, the ionomycin- or thapsigargin-induced increases in [Ca2+]i were sufficient to translocate IL-33 from nucleus to cytoplasm and to the extracellular milieu. In human embryonic kidney (HEK-293) cells transfected with IL-1β genes, sustained increases in [Ca2+]i produced rapid secretion of mature IL-1β and unprocessed pro–IL-1β (67). In monocytes and macrophages, Ca2+ was involved in P2X7R-mediated secretion of mature IL-1β, while K+ efflux was involved in enzymatic processing of pro–IL-1β to mature IL-1β (67). Thus, the Ca2+-dependent secretory pathway/apparatus for IL-1 family cytokine release may be ubiquitously expressed regardless of the cell type, and increases in [Ca2+]i may be critical in secretion, but not processing, of IL-1 family molecules. Because IL-33 requires no proteolytic processing by caspase-1, the increases in [Ca2+]i may be sufficient to mobilize and release IL-33 from airway epithelial cells. As potential therapeutic targets, the molecules playing major roles in Ca2+ signal regulation and IL-33 release are of interest. We found that ATP is released within 60 s when airway epithelial cells are exposed to aeroallergens. Generally, ATP is stored at millimolar concentrations within cells, and disrupting plasma membrane integrity leads to ATP extracellular release (68). In both animals and plants, ATP is also released in noncytolytic conditions, such as membrane deformation, mechanical stress, osmotic stress, and exposure to proteases (69–71). Thus, ATP can be used to communicate tissue distress or injury to the immune system, promoting appropriate responses, for example, inflammation, restoration of homeostasis, and adaptation to the altered cellular conditions or environment. Activation of P2X7R by ATP facilitates the rapid influx of extracellular Na+ and Ca2+ and efflux of intracellular K+ (72). In optic nerve glia, low ATP concentrations mediate the increase in [Ca2+]i through P2Y2R and, at high concentrations, P2X7R is also activated, resulting in robust and sustained increases in [Ca2+]i (73). In our study of human airway epithelial cells, both P2X7R and P2Y2R were involved in the Ca2+ response and IL-33 release in vitro. Broad-spectrum inhibitors of P2 purinergic receptors and mice deficient in the P2Y2R gene showed a marked inhibition of innate Th2 cytokine production in response to Alternaria in vivo. Thus, the P2Y2R and perhaps the P2X7R play major roles in detecting the danger signal, extracellular ATP, and in triggering IL-33 release and the subsequent Th2-type responses. Some caution may be necessary to interpret the roles of specific receptors, however. Whereas the involvement of P2Y2R was observed in both human epithelial and mouse in vivo models, there appears to be discrepancy regarding the involvement of P2X7R. Gene-deficient mice might have unknown immunological abnormalities that we may not be aware of, or they might compensate for the deficiency in one gene (e.g., P2X7R) by upregulating other genes. The coupling of receptors to their effector molecules may be different between mice and humans. Furthermore, the mouse in vivo system may involve other cell types more than airway epithelial cells, which may overcome the deficiency in one cell type. Any of these mechanisms may produce the different observations between the mouse and human models. We were surprised by the rapid (by 12 h after allergen exposure) production of IL-5 and IL-13 in the lungs of naive mice; this cytokine response was independent of adaptive immunity. Endogenous IL-33 and its receptor, ST2, mediated this “innate” Th2 cytokine response. Robust IL-6 production was also observed within 12 h of Alternaria exposure (Fig. 2), suggesting that this cytokine may be involved in Th2-type immune responses of the airways to inhaled allergens (74). A major question remains regarding the cellular source of innate IL-5 and IL-13. Recently, exogenous IL-25 and IL-33 or infection with helminths induced proliferation of novel non-T/non-B cells that produced abundant IL-5 and IL-13 (12, 30, 31, 37, 75, 76). These innate IL-13–expressing cells are likely dispersed throughout the animals’ bodies (32). Indeed, we found comparable lineage−CD25+CD44+ cells in lungs of naive mice. These lineage−CD25+CD44+ cells expressed Sca-1, IL-7Rα, ST2, ICOS, and MHC class II, presented lymphocytic morphology, and produced a large quantity of IL-5 and IL-13 when cultured with IL-33 in vitro (data not shown). These novel non-T/non-B lymphocytes cells may mediate early innate Th2-type immune responses after airway exposure to airborne allergens. Further studies are necessary to verify this speculation. Our studies provide a mechanistic explanation for the initiation phase of such innate Th2-type immunity, namely the ATP- and Ca2+-dependent release of stored IL-33 from structural cells. In recent years, considerable progress has been made to understand better the innate immune responses to infection and tissue injury (6, 66). Our observations add to this knowledge. The airway’s innate Th2-type responses may be triggered by the epithelial cells’ ability to sense noncytotoxic cellular stress by means of ATP. Thus, some chronic inflammatory conditions in humans, such as asthma, may be better understood in this broader context of inflammation rather than the classic models of infection and injury. Manipulating tissue stress responses by intervening in the ATP/P2 purinergic receptor pathways may prevent development and exacerbation of such diseases. We thank Dr. Larry R. Pease and Dr. Andrew N. McKenzie for providing MyD88−/− and ST2−/− mice, respectively. We thank Cheryl R. Adolphson for editorial assistance, LuRaye S. Eischens for secretarial help, and Gail M. Kephart and Peter J. Maniak for technical assistance. This work was supported in part by National Institutes of Health Grants AI34486 and AI49235 (to H.K.) and DK074010 and HL095811 (to S.M.O. ), as well as by the Mayo Foundation.
. 2010. How are TH2-type immune responses initiated and amplified? Nat. Rev. Immunol. 10: 225–235. 2004. The immunogenetics of asthma and eczema: a new focus on the epithelium. Nat. Rev. Immunol. 4: 978–988.
. 1999. The role of allergy in the development of asthma. Nature 402(6760, Suppl.)B12–B17.
. 2009. Biology of lung dendritic cells at the origin of asthma. Immunity 31: 412–424.
. 2010. The many paths to asthma: phenotype shaped by innate and adaptive immunity. Nat. Immunol. 11: 577–584. 2008. Origin and physiological roles of inflammation. Nature 454: 428–435.
. 2002. Lipopolysaccharide-enhanced, Toll-like receptor 4-dependent T helper cell type 2 responses to inhaled antigen. J. Exp. Med. 196: 1645–1651.
. 2009. Allergenicity resulting from functional mimicry of a Toll-like receptor complex protein. Nature 457: 585–588. 2002. The danger model: a renewed sense of self. Science 296: 301–305.
. 2008. Alum adjuvant boosts adaptive immunity by inducing uric acid and activating inflammatory dendritic cells. J. Exp. Med. 205: 869–882.
. 2010. The IL-1 family: regulators of immunity. Nat. Rev. Immunol. 10: 89–102.
. 2008. 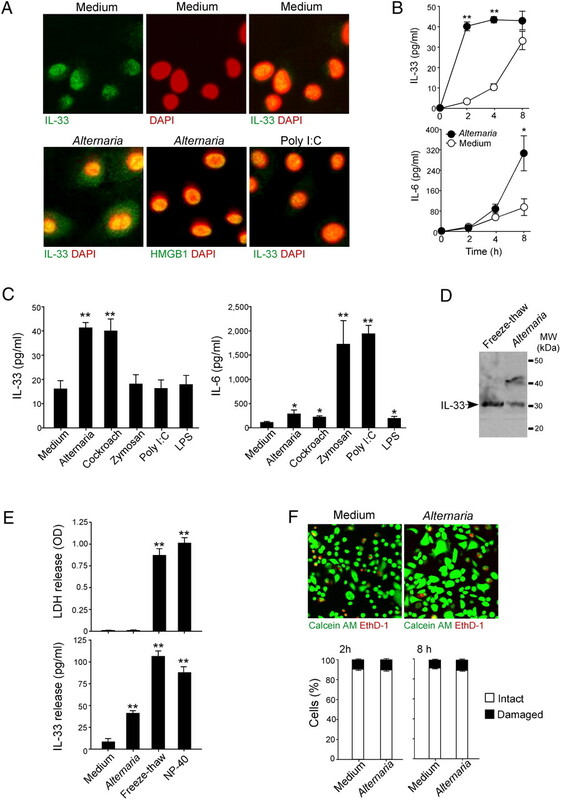 The IL-1-like cytokine IL-33 is constitutively expressed in the nucleus of endothelial cells and epithelial cells in vivo: a novel “alarmin”? PLoS ONE 3: e3331.
. 2009. Sequence variants affecting eosinophil numbers associate with asthma and myocardial infarction. Nat. Genet. 41: 342–347.
. 2009. The cytokine interleukin-33 mediates anaphylactic shock. Proc. Natl. Acad. Sci. USA 106: 9773–9778.
. 2010. Disease-associated functions of IL-33: the new kid in the IL-1 family. Nat. Rev. Immunol. 10: 103–110.
. 2007. IL-33 induces IL-13 production by mouse mast cells independently of IgE-FcεRI signals. J. Leukoc. Biol. 82: 1481–1490.
. 2009. The pro-Th2 cytokine IL-33 directly interacts with invariant NKT and NK cells to induce IFN-γ production. Eur. J. Immunol. 39: 1046–1055.
. 2009. 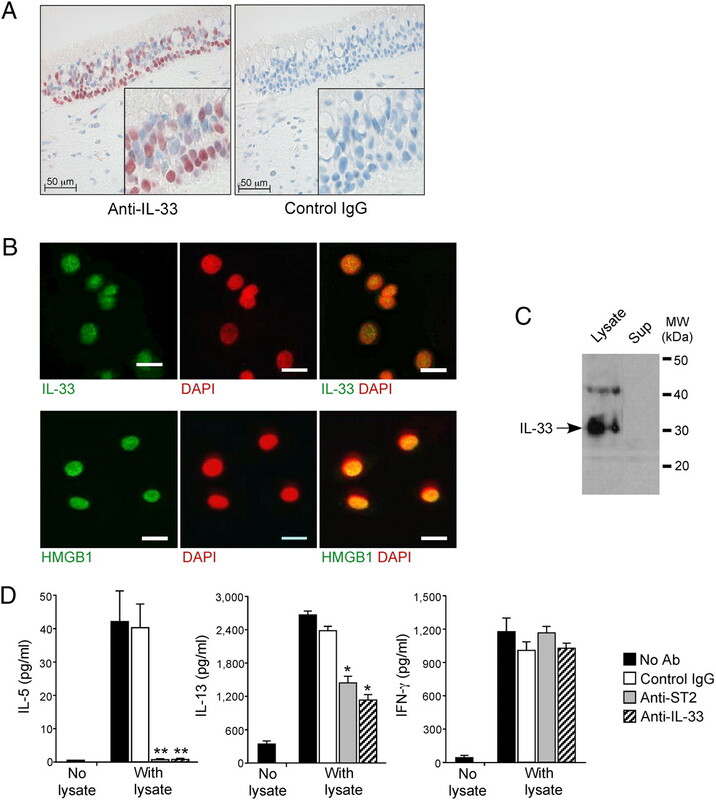 IL-33-activated dendritic cells induce an atypical TH2-type response. J. Allergy Clin. Immunol. 123: 1047–1054.
. 2010. Innate production of TH2 cytokines by adipose tissue-associated c-Kit+Sca-1+ lymphoid cells. Nature 463: 540–544.
. 2010. Nuocytes represent a new innate effector leukocyte that mediates type-2 immunity. Nature 464: 1367–1370.
. 2010. Systemically dispersed innate IL-13-expressing cells in type 2 immunity. Proc. Natl. Acad. Sci. USA 107: 11489–11494.
. 2009. Interleukin-33 is biologically active independently of caspase-1 cleavage. J. Biol. Chem. 284: 19420–19426.
. 2009. IL-33 raises alarm. Immunity 31: 5–7.
. 2008. Welcome to the neighborhood: epithelial cell-derived cytokines license innate and adaptive immune responses at mucosal sites. Immunol. Rev. 226: 172–190.
. 2006. The link between fungi and severe asthma: a summary of the evidence. Eur. Respir. J. 27: 615–626.
. 2004. Alternaria-induced asthma. J. Allergy Clin. Immunol. 113: 227–234.
. 1991. Exposure to an aeroallergen as a possible precipitating factor in respiratory arrest in young patients with asthma. N. Engl. J. Med. 324: 359–363.
. 1997. The effect of outdoor fungal spore concentrations on daily asthma severity. Environ. Health Perspect. 105: 622–635.
. 2001. Clinical importance of Alternaria exposure in children. Am. J. Respir. Crit. Care Med. 164: 455–459.
. 2000. T1/ST2-deficient mice demonstrate the importance of T1/ST2 in developing primary T helper cell type 2 responses. J. Exp. Med. 191: 1069–1076.
. 2003. Marked airway eosinophilia prevents development of airway hyper-responsiveness during an allergic response in IL-5 transgenic mice. J. Immunol. 170: 5756–5763.
. 2007. IL-33 is a chemoattractant for human Th2 cells. Eur. J. Immunol. 37: 2779–2786. 2008. The interleukin-1 receptor/Toll-like receptor superfamily: 10 years of progress. Immunol. Rev. 226: 10–18.
. 2005. High-mobility group box 1 protein (HMGB1): nuclear weapon in the immune arsenal. Nat. Rev. Immunol. 5: 331–342.
. 1997. Sensitization to inhaled allergens as a risk factor for asthma and allergic diseases in Chinese population. J. Allergy Clin. Immunol. 99: 594–599.
. 2006. Adenosine 5′-triphosphate and adenosine as endogenous signaling molecules in immunity and inflammation. Pharmacol. Ther. 112: 358–404.
. 1998. Regulation of interleukin 1 signalling through integrin binding and actin reorganization: disparate effects on NF-κB and stress kinase pathways. Biochem. J. 330: 975–981.
. 2007. Chemotactic activity of extracellular nucleotideson human immune cells. Purinergic Signal. 3: 5–11.
. 2004. Cellular distribution and functions of P2 receptor subtypes in different systems. Int. Rev. Cytol. 240: 31–304. 2002. Molecular physiology of P2X receptors. Physiol. Rev. 82: 1013–1067.
. 2008. ATP is released by monocytes stimulated with pathogen-sensing receptor ligands and induces IL-1β and IL-18 secretion in an autocrine way. Proc. Natl. Acad. Sci. USA 105: 8067–8072.
. 1992. PPADS, a novel functionally selective antagonist of P2 purinoceptor-mediated responses. Eur. J. Pharmacol. 217: 217–219. 1993. Excitement about calcium signaling in inexcitable cells. Science 262: 676–678.
. 2010. A large-scale, consortium-based genomewide association study of asthma. N. Engl. J. Med. 363: 1211–1221.
. 2010. Increased IL-33 expression by epithelial cells in bronchial asthma. J. Allergy Clin. Immunol. 125: 752–754.
. 2010. The sterile inflammatory response. Annu. Rev. Immunol. 28: 321–342.
. 2003. Essential role for Ca2+ in regulation of IL-1β secretion by P2X7 nucleotide receptor in monocytes, macrophages, and HEK-293 cells. Am. J. Physiol. Cell Physiol. 285: C286–C299.
. 2008. The inflammatory response to cell death. Annu. Rev. Pathol. 3: 99–126.
. 2001. Purinergic signalling: ATP release. Neurochem. Res. 26: 959–969.
. 2000. Effect of shear stress on the release of soluble ecto-enzymes ATPase and 5′-nucleotidase along with endogenous ATP from vascular endothelial cells. Br. J. Pharmacol. 129: 921–926.
. 2010. Receptor-promoted exocytosis of airway epithelial mucin granules containing a spectrum of adenine nucleotides. J. Physiol. 588: 2255–2267.
. 1996. The cytolytic P2Z receptor for extracellular ATP identified as a P2X receptor (P2X7). Science 272: 735–738.
. 2001. P2X and P2Y purinoreceptors mediate ATP-evoked calcium signalling in optic nerve glia in situ. Cell Calcium 30: 251–259.
. 2002. Induction of NFATc2 expression by interleukin 6 promotes T helper type 2 differentiation. J. Exp. Med. 196: 39–49.
. 2006. Identification of an interleukin (IL)-25-dependent cell population that provides IL-4, IL-5, and IL-13 at the onset of helminth expulsion. J. Exp. Med. 203: 1105–1116.
. 2001. IL-25 induces IL-4, IL-5, and IL-13 and Th2-associated pathologies in vivo. Immunity 15: 985–995.